I recently wrote a blog about the world’s hardest driving tests but what about the easiest ones? If you can’t imagine a test so easy that all you have to do is drive in a straight line, turn left and stop after 50 yards to pass, then read on. According to expert opinion, there are many countries across the European Union where passing your test is not difficult, including Greece, Moldova and Belarus. Looking further afield, it is also apparently very easy to pass your driving test in Pakistan, India, Mexico, Honduras and Egypt. In fact, in some countries it’s so easy to pass simply because there is no driving test at all. Mexico City is densely populated and heavily polluted, largely due to the four million cars milling around on its roads. In Mexico City, if you are over the age of 18, a driving test is not necessary as the driving licence is thought of “as a method of regulating drivers instead of certifying them, and thus issues licences without any sort of test”. Despite not needing to take a test to get a licence, applicants must sign a document declaring they can drive. A licence can be purchased for 626 pesos (roughly £28). It is perhaps due to this unrestricted self-certification of drivers that 16,714 people were killed on Mexico’s roads in 2010. Red Driving School, who researched the easiest and hardest tests, awarded Mexico with 1 out of 5 (with 1 being extremely easy) for the ease of the test. While you need to take a theory test and short practical test to get a licence in Pakistan, these can be taken on the same day and there is no requirement to have completed a minimum number of driving hours before taking your test. Once you’ve proved you can read a number plate from 20.5m, you simply drive through a short track marked out by cones then reverse back. There were 30,131 road deaths in Pakistan in 2010, almost twice as many as in Mexico City. Red Driving School awarded Pakistan 2 out of 5 for the ease of the test. According to the World Health Organisation, India had the second highest number of road fatalities in the world in 2010, standing at 231, 027. This might be related to how easy it is to pass your driving test, that’s if you choose to take it. According to an interviewee who appeared on BBC Top Gear you don’t have to take a driving test in India. Instead you can pay 500 to 1000 rupees to an out of state driving agent and you get an out of state licence which is valid all over the country. However, for those who wish to actually sit the test in India, you only have to drive in a straight line, take a left and stop after 50 yards. It’s as simple as that. In 2011 South Korea made it much easier to acquire a driving licence by cutting the number of hours training required from 25 to 13. South Korea’s driving licencing body KoROAD said it did this “in the interests of public convenience”. So South Koreans can now acquire a licence after just 13 hours of tuition and a payment of 450,000 WON (£277). Conversely, in 2013 China toughened up its rules for getting a driving licence, meaning that applicants have to complete 78 hours of tuition costing 4000 Chinese Yuan Renminbi (£429). As a result South Korea has seen a huge increase in the number of Chinese taking driving tests in South Korea – increasing from 7,064 in 2010 to 24,687 in 2013. According to the Financial Times, good Chinese drivers can get a South Korean licence in one day for Won 67,000 (£41) – at a fraction of the cost of the Chinese licence – which they convert once they return home. This shows how easy it is to get around the system. Despite making it harder to get a licence China has the highest number of road traffic deaths in the world – 275,983 in 2010. The Honduran test, according to one source is a mere bagatelle. There is no practical driving test, only a short written test to complete before you are deemed fit to handle the roads. In 2010 there were 1,425 road deaths, or almost 19 deaths per 100,000 population. The Egyptian driving test, if you could be permitted to call it that, is similarly effortless. Until recently candidates only had to drive six metres forward and then reverse six metres back. Recently though the test was ‘toughened’ up. Now candidates have to answer 8 out of 10 questions correctly in a computer test, have their parking skills assessed and pass a forward and reverse S-track test. 10,729 people died on Egypt’s roads in 2010, which is just over 13 deaths per 100,000 population. While researching the world’s easiest driving tests I came across some highly unusual and occasionally eyebrow raising elements in some countries’ driving tests. Take Russia’s for example. The test includes a slalom between poles and after this drivers must accelerate at speed from a standing start and then break before a designated marker without leaving skid marks. “Most people cannot pass the test because this steering method is completely alien to them. Fortunately or unfortunately, depending on your point of view, the officer running the test just ignores the fact no one can do it and passes virtually everyone”. In some countries it’s all about dexterity. In Peru for example, candidates must be able to touch their nose with their eyes closed, while those in Taiwan have be able to wiggle all 10 fingers in order to pass the medical component of the test. In Sierra Leone, instead of reading the Highway Code, candidates must buy and play a board game testing them on the country’s driving laws. And until 2013 candidates taking the Chinese driving test were advised “when a head-on collision is unavoidable, the driver should free the steering wheel, raise the leg and lie sideways on the seat’. Perhaps most bizarrely, in Belize, the Highway Code advises not driving with a baby on your lap “because the baby might grab your arm and cause an accident”. 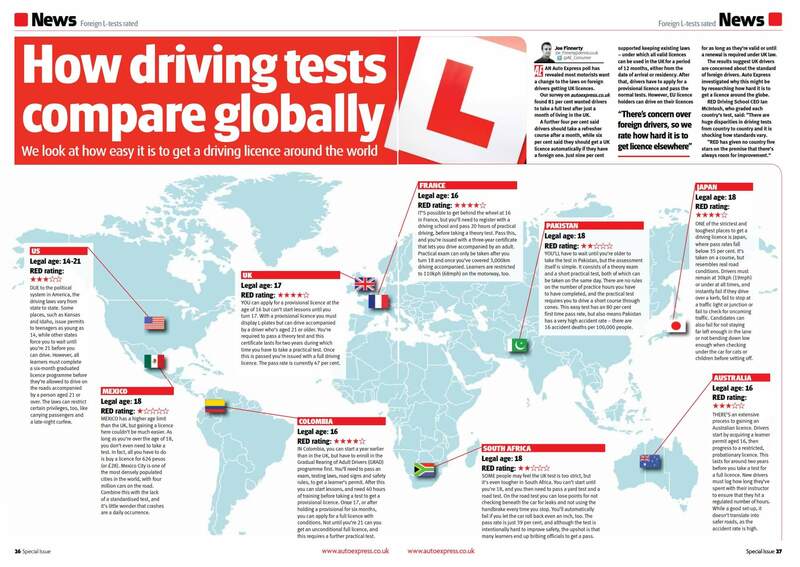 Driving tests vary hugely from country to country and I suspect we will never see a point where the driving test is homogenised across multiple countries or continents. But there is a clear correlation between high road traffic deaths and countries where driving tests are easier to pass.